DVD Synopsis: In the mid-16th century, after annihilating the Incan empire Gonzalo Pizarro (Allejandro Repulles) leads his army of conquistadors over the Andes into the heart of the most savage environment on earth in search of the fabled City of Gold, El Dorado. As the soldiers battle starvation, Indians, the forces of nature, and each other, Don Lope de Aguirre (Klaus Kinski), "The Wrath of God," is consumed with visions of conquering all of South America and revolts, leading his own army down a treacherous river on a doomed quest into oblivion. The opening scene of Werner Herzog's Aguirre: The Wrath of God looks as if it was lifted directly from a dream, or perhaps even a nightmare: Spanish Conquistadors, with nothing but a crude dirt path and some jagged rocks to guide them, make their way down a mountainside. Slowly, methodically, they descend from the clouds, wondering what perils await them around each and every turn. Thus, the tone of Aguirre: The Wrath of God is established, its world created. With the famous Peruvian expedition of 16th Century explorer Gonzalo Pizarro serving as the subplot, Herzog weaves Aguirre Wrath of God into a mystical tale of greed and power. Pizarro (Alejandro Repulles) is determined to track down the fabled city of El Dorado, which he’s been told is made entirely of gold. But Pizarro’s men are exhausted from their long journey, so the explorer decides to send a smaller delegation ahead to locate the golden city. This expedition, which will travel by river on hastily constructed rafts, is to be led by Pedro de Ursua (Ray Guerra), with Lope de Aguiire (Klaus Kinski) serving as his second in command. But shortly after the expedition is underway, a conflict between Aguirre and Ursua leads to a violent mutiny, resulting in Aguirre, a man driven by greed and a thirst for glory, taking control of the doomed excursion. In the director's typical fashion, the film's jungle setting becomes as much a character in the film as any portrayed by the actors. Herzog has stated many times in interviews that he never selects a film’s setting simply for its beauty, or to “dress up” the background; it must take on “almost human qualities”, and the jungles of Aguirre: The Wrath of God do just that. It is a fierce, unforgiving place, an untamed wilderness as dangerous as it is beautiful. The rafts are tossed from side to side by the river’s raging current, and the jungle itself, dark and ominous, seems to mock the travelers as their journey stretches from days into weeks, with no end in sight. While making Aguirre: The Wrath of God, Herzog himself would suffer through a great many ordeals, including the perils of filming in the jungle and the notorious temper of his leading man, Klaus Kinski. Yet, as was the case time and again throughout his career, his pain never goes unrewarded. As a result of Herzog's “method”, each one of his films exudes a total sense of period and place, as if they’d actually found a way to travel backwards in time, physically inhabiting the world they sought merely to recreate. 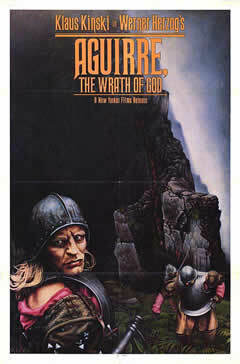 Aguirre: The Wrath of God is a perfect example of the "Herzog style", not to mention the director's finest achievement. It is so alive, so organically progressive, that it doesn’t even seem like a film. It is, as I said, like a dream…or perhaps even a nightmare. Kinski was perfect in Aguire - there was never a better raving madman in film! This was also the movie that initially got me interested in Herzog as a director - now i can't get enough of his films. Great review! @Klaus: This movie is on my top-10 of all-time list. I love it more and more after every viewing. And yes, Aguirre is the role that Klaus Kinski was born to play! It's hard to argue against the worthiness of Aguirre on anyone's top 10 list, but i'm still partial to Fitzcarraldo (1982) as my favorite Kinski/Herzog film. @Klaus: I'll have to go back and watch FITZCARALDO again. It's been a long time, but I do remember liking it very much. Still, it'll have to go a long way to replace AGUIRRE! One of the very best. This film is always in my top ten. Seeing it on the big screen is on my bucket list.